Hillary Chybinski: extreme home makeover. . .holiday style. 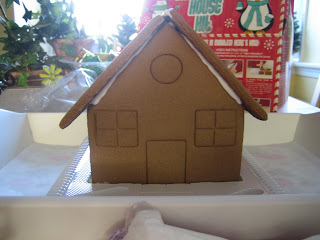 . .
extreme home makeover. . .holiday style. 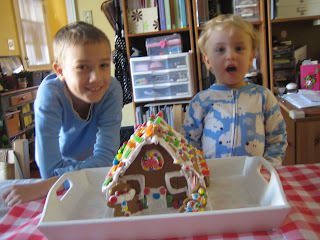 . .
. . .this morning, bright and early, the boys and i cracked open our Gingerbread House kit. we had bought a kit at Target, when they first put the holiday stuff out - i planned to build it on christmas eve. so i read the directions and got the dining room table all set up. The kit provides a website with instructional videos too! not too shabby - looks cute, seems to be holding together well. 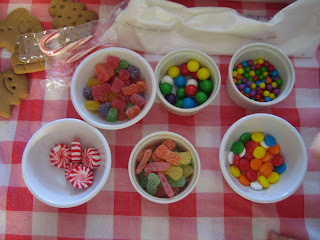 we opened up the little bags of candy - one candy cane was broken, but we had a spare. . .i also added some sour patch kids to the mix. . .we were ready to decorate. i let the kids do what they wanted - i squirted the icing where they each wanted to decorate and let them put the candies on however they wanted. they had a great time - and each seemed pleased with their results. i am tickled with our finished product - and even let them eat a piece of candy off the house.